There’s no better way to express your feelings or gratitude than with a gorgeous bouquet of fuchsia or hot pink roses, pink lilies and filler in a tall glass vase... the perfect gift for any occasion. NB: Lilies arrive mostly in bud on delivery. Picture shows Large Size. Legend has it that pink lilies have a connection to motherhood, and they also symbolize new love, which makes this combination of delicate flowers like Pink Lilies, Cerise Roses and filler in a vase a delightful bouquet for a New Mom, Birthday, Thank You or just about any occasion. 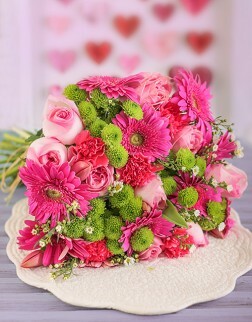 The pink lilies and pink roses are available for same day delivery in Durban, South Africa. See delivery restrictions tab for more info. NB: Lilies arrive mostly in bud to ensure they are fresh and will last longer.